A Word from God | Teaching of a Relationship NOT a Religion! Teaching of a Relationship NOT a Religion! In Chapter 11 of Matthew Jesus addresses the people concerning John the Prophet and Himself. He also condemns those who reject their ministries. And at the end He invites those who are burdened by religion to come to Him. You have heard the Words of Jesus and you can choose to hear them or reject them. Christ desires that we hear them and for us to answer His Call to Salvation. Will you reject or accept? In these final verses of Matthew chapter 10, Jesus instructs His Disciples to have no fear, to deny themselves even unto death. Christians today are instructed by the Lord to do the same. The cost of following Jesus in a broken, sin filled world can be great. With Christ by our sides and with our Faith in Him, the reward will be even greater. Come and make a choice to follow Jesus TODAY! 11 Truly, I say to you, among those born of women there has arisen no one greater than John the Baptist. Yet the one who is least in the kingdom of heaven is greater than he. 12 From the days of John the Baptist until now the kingdom of heaven has suffered violence, and the violent take it by force. 13 For all the Prophets and the Law prophesied until John, 14 and if you are willing to accept it, he is Elijah who is to come. 15 He who has ears to hear, let him hear. In this 10th chapter of Matthew, Jesus is Calling His Disciples to send them out to preach the Gospel. This same Calling goes out to all Christians. We are to proclaim the Good News of Jesus Christ! Being a disciple of Christ is not easy in this Sin filled world where evil is so welcomed over godliness. Christ warns us that even our own families will be against us. Only with Jesus can we endure! And he called to him his twelve disciples and gave them authority over unclean spirits, to cast them out, and to heal every disease and every affliction. The names of the twelve apostles are these: first, Simon, who is called Peter, and Andrew his brother; James the son of Zebedee, and John his brother; Philip and Bartholomew; Thomas and Matthew the tax collector; James the son of Alphaeus, and Thaddaeus; Simon the Zealot, and Judas Iscariot, who betrayed him. These twelve Jesus sent out, instructing them, “Go nowhere among the Gentiles and enter no town of the Samaritans, but go rather to the lost sheep of the house of Israel. And proclaim as you go, saying, ‘The kingdom of heaven is at hand.’ Heal the sick, raise the dead, cleanse lepers, cast out demons. You received without paying; give without pay. Acquire no gold or silver or copper for your belts, no bag for your journey, or two tunics or sandals or a staff, for the laborer deserves his food. And whatever town or village you enter, find out who is worthy in it and stay there until you depart. As you enter the house, greet it. And if the house is worthy, let your peace come upon it, but if it is not worthy, let your peace return to you. And if anyone will not receive you or listen to your words, shake off the dust from your feet when you leave that house or town. Truly, I say to you, it will be more bearable on the day of judgment for the land of Sodom and Gomorrah than for that town. “Behold, I am sending you out as sheep in the midst of wolves, so be wise as serpents and innocent as doves. Beware of men, for they will deliver you over to courts and flog you in their synagogues, and you will be dragged before governors and kings for my sake, to bear witness before them and the Gentiles. When they deliver you over, do not be anxious how you are to speak or what you are to say, for what you are to say will be given to you in that hour. For it is not you who speak, but the Spirit of your Father speaking through you. Brother will deliver brother over to death, and the father his child, and children will rise against parents and have them put to death, and you will be hated by all for my name’s sake. But the one who endures to the end will be saved. When they persecute you in one town, flee to the next, for truly, I say to you, you will not have gone through all the towns of Israel before the Son of Man comes. “A disciple is not above his teacher, nor a servant above his master. It is enough for the disciple to be like his teacher, and the servant like his master. If they have called the master of the house Beelzebul, how much more will they malign those of his household. Continuing in Matthew 9, we find Jesus very busy dealing with the people and their needs. Christ is our example of how hard we should be working for others. Pray that God will bring workers to the fields and when you do, be ready to be put into service! Often God uses those who pray such prayers, as His instrument to point the Way to Him. 18 While he was saying these things to them, behold, a ruler came in and knelt before him, saying, “My daughter has just died, but come and lay your hand on her, and she will live.” 19 And Jesus rose and followed him, with his disciples. 20 And behold, a woman who had suffered from a discharge of blood for twelve years came up behind him and touched the fringe of his garment, 21 for she said to herself, “If I only touch his garment, I will be made well.” 22 Jesus turned, and seeing her he said, “Take heart, daughter; your faith has made you well.” And instantly the woman was made well. 23 And when Jesus came to the ruler’s house and saw the flute players and the crowd making a commotion, 24 he said, “Go away, for the girl is not dead but sleeping.” And they laughed at him. 25 But when the crowd had been put outside, he went in and took her by the hand, and the girl arose. 26 And the report of this went through all that district. 27 And as Jesus passed on from there, two blind men followed him, crying aloud, “Have mercy on us, Son of David.” 28 When he entered the house, the blind men came to him, and Jesus said to them, “Do you believe that I am able to do this?” They said to him, “Yes, Lord.” 29 Then he touched their eyes, saying, “According to your faith be it done to you.” 30 And their eyes were opened. And Jesus sternly warned them, “See that no one knows about it.” 31 But they went away and spread his fame through all that district. STOP WAITNG for the life Christ intends for you and start on the path of Christian success. These seven habits will help you on your way to a successful and rewarding experience with God, isn’t that a wonderful thought? IT’S NEVER TOO LATE for God to change you, your life and your circumstances. Just give Him what He wants the most, YOU! 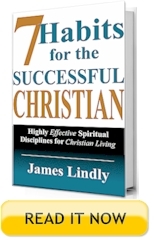 These seven habits of successful Christians will show you how to do it. LEARN THE SECRETS of living for God. Unlock the joy, confidence and victorious life every Christian should be experiencing. LIVE NOW, live life for God, live life to the fullest. Put away selfish ambitions and give your life completely over to God, it’s time! In these verses, Jesus is healing the sick, calling sinners to discipleship and offering Grace to fulfill the Law of Religion. Are you ready for something new with Jesus? Ask Him today to start a NEW life with Him and watch as he transforms you! 9 And getting into a boat he crossed over and came to his own city. 2 And behold, some people brought to him a paralytic, lying on a bed. And when Jesus saw their faith, he said to the paralytic, “Take heart, my son; your sins are forgiven.” 3 And behold, some of the scribes said to themselves, “This man is blaspheming.” 4 But Jesus, knowing their thoughts, said, “Why do you think evil in your hearts? 5 For which is easier, to say, ‘Your sins are forgiven,’ or to say, ‘Rise and walk’? 6 But that you may know that the Son of Man has authority on earth to forgive sins”—he then said to the paralytic—“Rise, pick up your bed and go home.” 7 And he rose and went home. 8 When the crowds saw it, they were afraid, and they glorified God, who had given such authority to men. 9 As Jesus passed on from there, he saw a man called Matthew sitting at the tax booth, and he said to him, “Follow me.” And he rose and followed him. In the following verses, we will learn about the cost of following Jesus. We will see His Divine Power over Nature and we will get a preview of what’s in store for the demons and for all those who do not accept Christ! Following Jesus is not an easy road to travel. But if you choose to follow Him, He will be there in all your Storms as He leads you too His Father’s Kingdom. 28 And when he came to the other side, to the country of the Gadarenes, two demon-possessed men met him, coming out of the tombs, so fierce that no one could pass that way. 29 And behold, they cried out, “What have you to do with us, O Son of God? Have you come here to torment us before the time?” 30 Now a herd of many pigs was feeding at some distance from them. 31 And the demons begged him, saying, “If you cast us out, send us away into the herd of pigs.” 32 And he said to them, “Go.” So they came out and went into the pigs, and behold, the whole herd rushed down the steep bank into the sea and drowned in the waters. 33 The herdsmen fled, and going into the city they told everything, especially what had happened to the demon-possessed men. 34 And behold, all the city came out to meet Jesus, and when they saw him, they begged him to leave their region. 5 When he had entered Capernaum, a centurion came forward to him, appealing to him, 6 “Lord, my servant is lying paralyzed at home, suffering terribly.” 7 And he said to him, “I will come and heal him.” 8 But the centurion replied, “Lord, I am not worthy to have you come under my roof, but only say the word, and my servant will be healed. 9 For I too am a man under authority, with soldiers under me. And I say to one, ‘Go,’ and he goes, and to another, ‘Come,’ and he comes, and to my servant, ‘Do this,’ and he does it.” 10 When Jesus heard this, he marveled and said to those who followed him, “Truly, I tell you, with no one in Israel have I found such faith. 11 I tell you, many will come from east and west and recline at table with Abraham, Isaac, and Jacob in the kingdom of heaven, 12 while the sons of the kingdom will be thrown into the outer darkness. In that place there will be weeping and gnashing of teeth.” 13 And to the centurion Jesus said, “Go; let it be done for you as you have believed.” And the servant was healed at that very moment. In this 8th chapter of Matthew, Jesus heals many people. No one in the history of the world has ever done such healings, yet Christ did them effortlessly. These miracles were to demonstrate that Jesus is truly the messiah that was promised in the OT. Jesus wants to heal us too from our Sin. Take His offer of Salvation and follow His Lead. After Jesus ends His Sermon on the Mount, the Bible tells us of the reaction of the people who heard Him. They were astounded at His Words and how He had spoken them. They were astounded at the power behind His Words. They were astounded about Jesus! Christians serve the Living God who has all authority over all things. Jesus is bringing His Sermon on the Mount to a close with a parable of two types of people. The Wise and the foolish. Christ is dividing the choices we have straight down the center. Either we choose Him or we choose destruction. Both are building a house. Both hear instruction on choosing the right foundation. Both make a choice on the type of foundation to use. The wise person who obeyed the instruction and built on the Rock survives the storm. The foolish person who disobeyed the instruction and built on the sand is taken by the storm.